Today is national cheese fondue day! 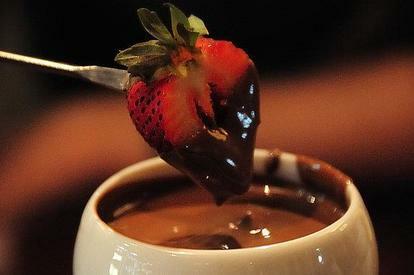 So why not try a Chocolate Cheese Fondue!! Make a simple dessert or romantic dinner!! Gradually add cocoa and sugar, and blend thoroughly to make a smooth sauce. Add cheese, and blend well. Stir in cinnamon, nutmeg, vanilla, peppermint, and almond extract. Gradually add milk until fondue is of desired consistency. Add brandy (do NOT stir); immediately ignite brandy.